To have energy, you need healthy mitochondria. 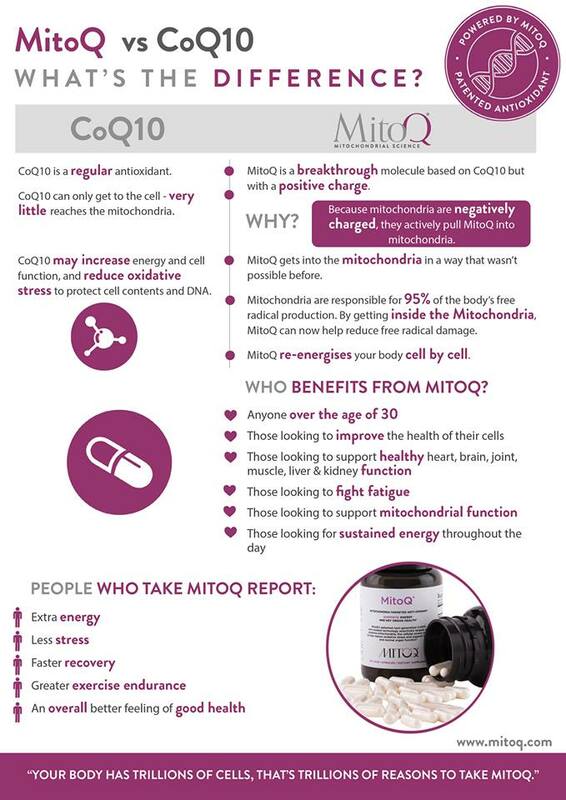 CoEnzyme Q10 is needed for mitochondrial health, but unfortunately the usual supplement form has a hard time actually entering the cell wall and getting to the mitochondria. MitoQ is bound with the addition of an ion called Triphenylphosphonium, which gives it a positive charge and helps it enter the cell and feed the mitochondria. "I recently started taking MitoQ and was very impressed by the result. Despite many years of good diet and habits, I could not shake an afternoon fatigue. I eventually resorted to a daily dose of tea or chocolate to get me through the afternoon. The afternoon slump would usually turn into an early evening headache. I was so used to these headaches that I stopped even registering them as a problem. I tried adaptogens and sea salt and all sorts of things. It wasn’t until I found MitoQ that my afternoon slump disappeared! I stopped even craving tea or chocolate, and some days I would make it to the evening without even realizing that I had passed my slump time without an issue." Take 2 capsules each morning with water 30 minutes before breakfast. Why does MitoQ contain carrageenan? Carrageenan is a very minor component of the clear capsules used in MitoQ. In fact, most vegetarian capsules include trace amounts of carrageenan, but, as these amounts are so small, there is no requirement to include it in the label. However, the manufacturers of MitoQ make every effort to be completely transparent, which is why they include it in their label. Carrageenan is actually is a natural product derived from seaweed. Some claim that carrageenan is inflammatory and toxic, but the tests are inconclusive (many show no effects on the immune system), and all the tests that show any possible harm are dealing with carrageenan levels that are far greater than would ever be included in a supplement. Major reviews of the literature find it to be safe at normal levels (and the level in the capsules is far below that).